A German bounty hunter named Dr. King Schultz buys and frees a slave named Django, who he takes on as a partner in exchange for pointing out the identities two lucrative bounties. "Django Unchained" is a pre-Civil War western written and directed by Quentin Tarantino, who is known for his films "Pulp Fiction" and "Inglorious Basterds." 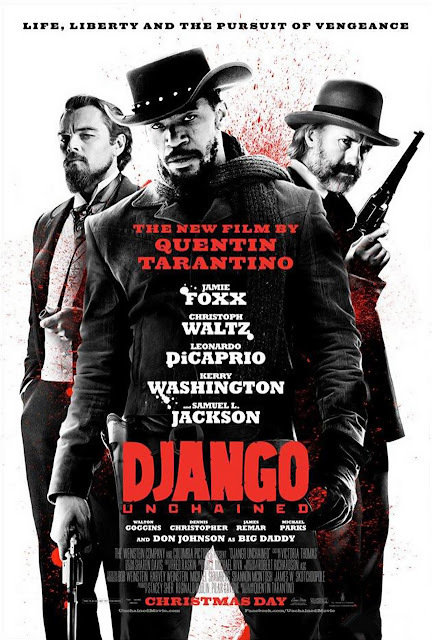 It stars Jamie Foxx as the titular Django, who begins the movie as a slave, but is bought and freed by a German dentist turned bounty hunter Dr. King Schutz, played by Christoph Waltz. Dr. King Schultz is looking for two bounties of whom Django knows the identities, and in exchange for pointing them out, Schultz gives Django his freedom, makes him his partner, and agrees to help him free his wife Broomhilda, played by Kerry Washington, from slavery. Broomhilda is owned by 'Monsieur' Calvin J. Candie, played by Leonardo DiCaprio, a wealthy plantation owner who is obsessed with French culture and regularly puts on 'Mandingo Fights' for sport. Quentin Tarantino brings his unique, character-driven vision to the western genre in "Django Unchained." He dabbled in this genre a little bit making "Kill Bill," but here, he goes all out. First off, Robert Richardson's cinematography in the film is stunning and amazing. The shots are expertly crafted and can be brutally breathtaking. There are some scenes that are downright violent, but at the same time, they are artfully crafted as the deep red color of blood is juxtaposed against white cotton, and white horses, and white walls. It's oddly gorgeous. And what would a Tarantino film be without his sharply engaging dialogue? And who better to deliver it than Christoph Waltz? Both times Tarantino has employed Waltz, it has produced an Oscar-winning performance. He is absolutely brilliant as Dr. King Schultz. Jamie Foxx and Samuel L. Jackson present two characters at the opposite end of the spectrum for those held in slavery pre-Civil war. Foxx's Django is a freed slave ready to stick it to the man acting as a beacon of hope for what is possible. He starts out as a timid man, but as King Schultz trains him in his bounty hunting ways, his inner menace comes out in full, brutal force. Jackson's Stephen is a vocal and vociferous personality and gains a small amount of power by endearing himself to his owners and aiding in the oppression of his fellow slaves. Two glorious and different performances that juxtapose one another nicely. Another actor here giving an amazing performance is Leonardo DiCaprio, who plays an utterly despicable character but does so exceedingly well. He has some of the most memorable scenes in the film, even though he's only in the latter portion of the film. Cunning, brutal, perverse, and darkly humorous, "Django Unchained" is an intense, bloody, engaging movie with stunning cinematography. It is one of Tarantino's best films.